Top row, left to right: Owner Mark Marinello, General Manager Kim McGonnell, and Managers Tyler Wussler and Blake Colbert. Front row left to right: Manager Katy Forret, Owner Brenda Harrity, Historical Village Executive Director Emilie Alfino, and Owner Marty Harrity. 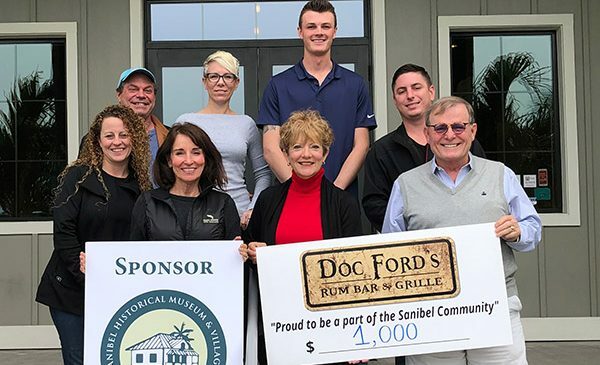 January 30, 2019 – The Sanibel Historical Village has recently announced that Doc Ford’s Rum Bar and Grille will be a silver sponsor of its February 19, 2019, Historical Village Gala. The event is currently sold out. Restaurant owner Marty Harrity said it is important to support the historical village. “History dictates the future, so the preservation of history is so important to all the new people who come here that we can educate about the history of our island,” Harrity said. So far, this year’s business sponsors include: Allegra Printing, Sanibel Catering by Bailey’s, Bank of the Islands, Congress Jewelers, Doc Ford’s Rum Bar & Grille Sanibel, The Grog Shop, Times of the Islands, John Grey Painting, Sanibel Captiva Beach Resorts, Sanibel Captiva Trust Company, and VIP Realty. Individual sponsors include: Edward and Catherine Anderson, Bill and Gail Bachman, Dennis and Blair Wyatt Berry, Wayne and Linda Boyd, Liz Clark, Ralph and Billye Curtis, Dorothy Donaldson and Aaron Cohen, Garlinghouse Foundation, Doug and Sherry Gentry, Roger and Sandra Grogman, Neal and Sherry Halleran, Pete and Jan Halliday, Bob and Jane Holder, Friedrich and Daniela Jaeger, Scotty Kelly, Karl and Jeri Magg, Edward and Dorothy Miller, Kevin and Deirdre O’Donnell, Bill and Stephanie Rahe, Todd and Karen Roberts, Ron and Faith Souders, Davis and Patricia Thurber, Rod and Gerry Verblaauw, Alex Werner and Karen Storjohann, and Larry and Judy Yenkole.